In this tutorial, you will learn how to create a Microsoft SQL Server database Instance (we call this a 'DB instance'), connect to the database, and delete the DB instance. We will do this using Amazon Relational Database Service (Amazon RDS) and everything done in this tutorial is free tier eligible. In this step, we will use Amazon RDS to create a Microsoft SQL Server DB Instance with db.t2.micro DB instance class, 20 GB of storage, and automated backups enabled with a retention period of one day. As a reminder, all of this is free tier eligible. c. You now have options to select your engine. 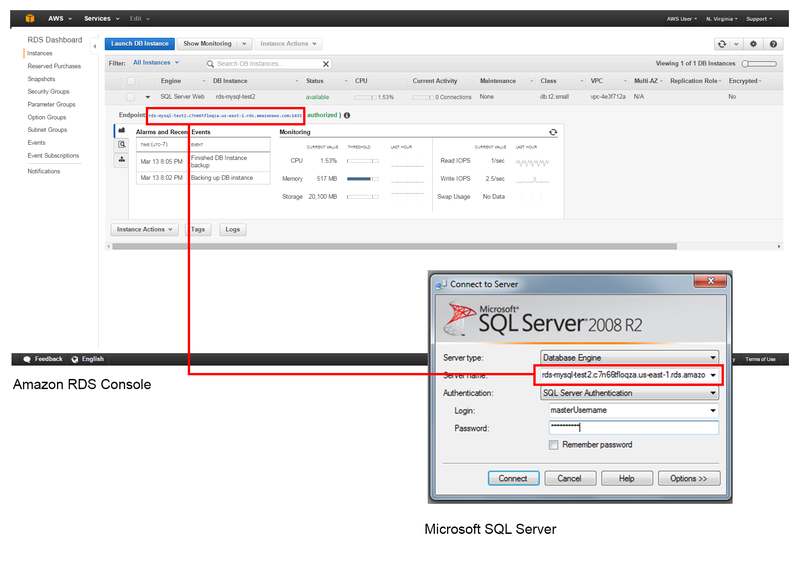 For this tutorial, click the Microsoft SQL Server icon and then click Select next to SQL Server Express. License Model: Leave the default value of license-included. Allocated Storage: Type 20 to allocate 20 GB of storage for your database. You can scale up to a maximum of 4 TB with Amazon RDS for SQL Server. DB Instance Modifier: Type a name for the DB instance that is unique for your account in the Region you selected. For this tutorial, we will name it myrdstest. e. You are now on the Configure Advanced Settings page where you can provide additional information that RDS needs to launch the Microsoft SQL Server DB instance. 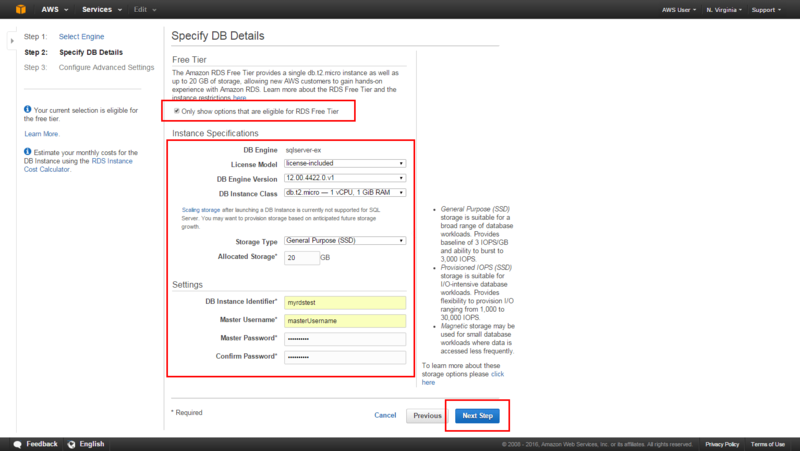 Expand the dropdown below to see the example settings for your DB instance. Database Port: Leave the default value of 1433. DB Parameter Group: Leave the default value of default.sqlserver-ex-12.0. For more information, see Working with DB Parameter Groups. Option Group: Select the default value of default.sqlserver-ex-12.00. 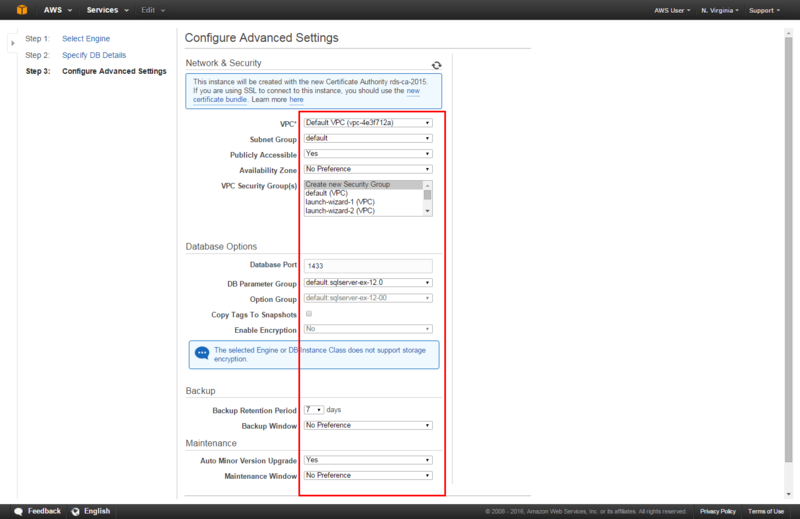 Amazon RDS uses option groups to enable and configure additional features. For more information, see Working with Option Groups. Copy Tags to Snapshot: Leave this box unchecked. Once the database instance creation is complete and the status changes to available, you can connect to a database on the DB instance using any standard SQL client. In this step, we will download Microsoft SQL Server Management Studio Express, a popular client for SQL Server. a. 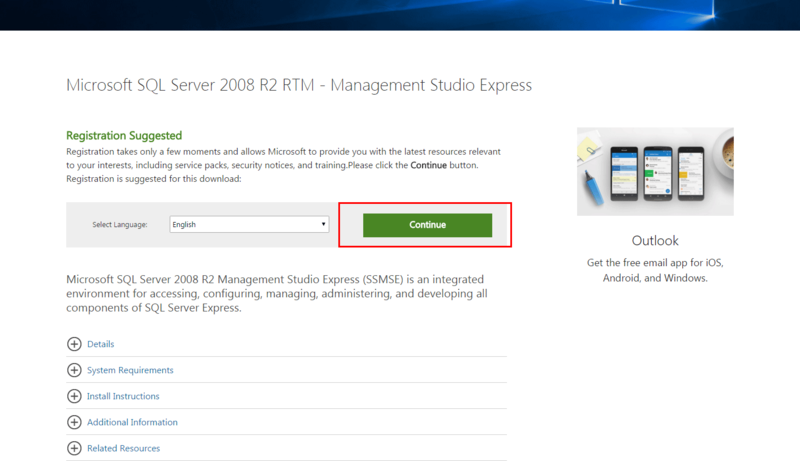 Go to the Microsoft Download Center - Microsoft SQL Server Management Studio Express page and click Continue. Note: Remember to download the SQL client to the same device from which you created the RDS DB Instance. The security group your database is placed in is configured to allow connection only from the device from which you created the DB instance. b. You will be prompted to register with Microsoft -- this step is not required for download. You can skip registration by selecting the radio button next to 'No, I do not want to register. Take me to the download' and click Next on the popup modal. 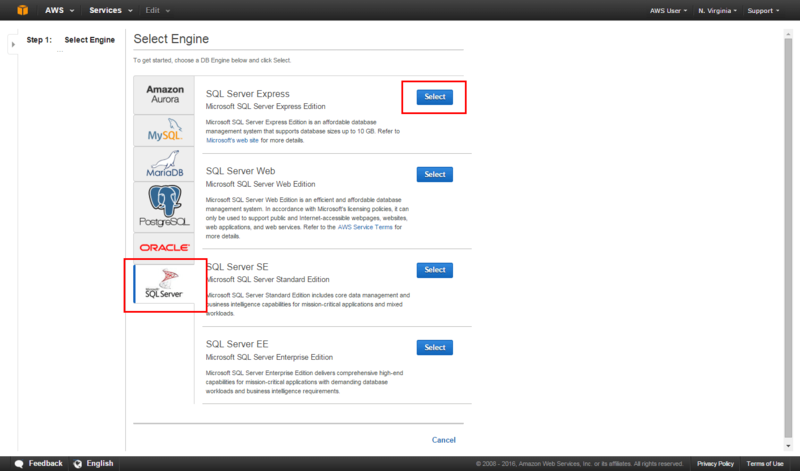 Then, select the SQL Management Studio you need and click Next to start your download. 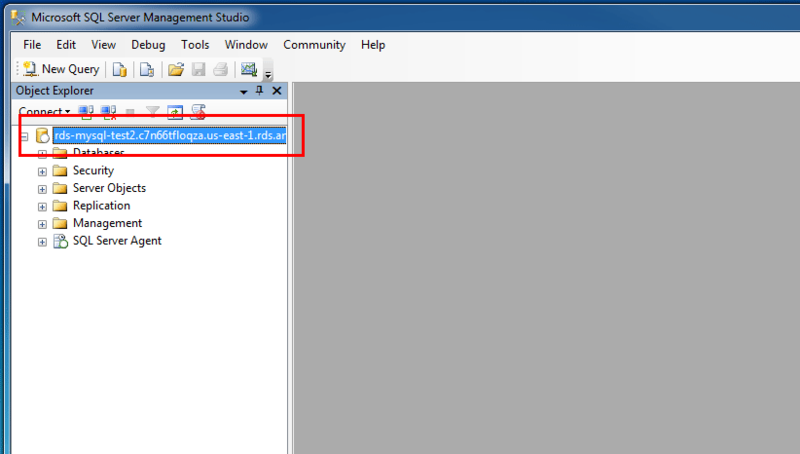 In this step, you will connect to the database you created using SQL Server Management Studio. 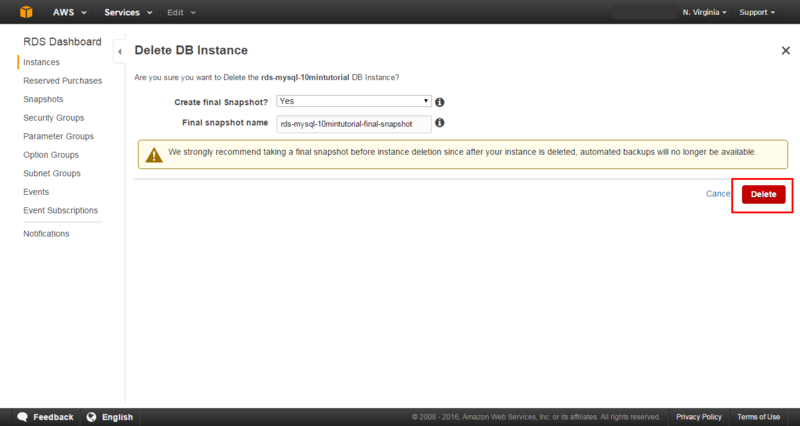 Hostname: Copy and paste the hostname from the Amazon RDS console as shown in the screenshot to the right. Afterwards, change the colon between the DNS and port number to a comma. For example, your server name should look like sample-instance.cg034hpkmmjt.us-east-1.rds.amazonaws.com,1433. b. You are now connected to the database. In the SQL Server Management Studio, you will see various schema objects available in the database. Now you can start creating tables, insert data, and run queries. 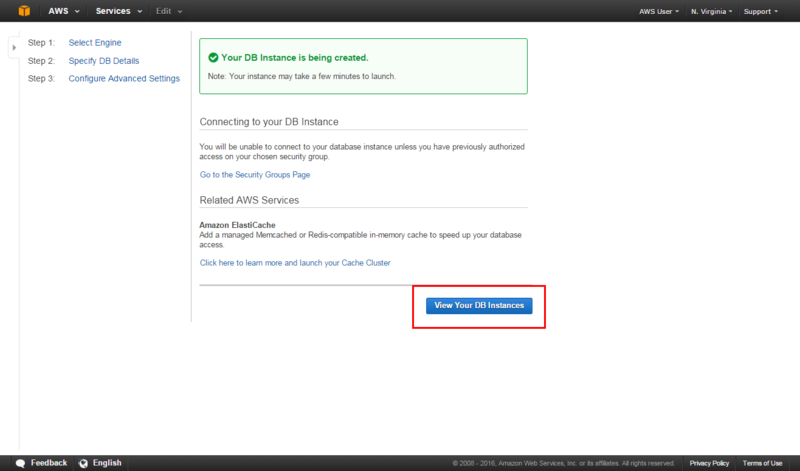 You can easily delete the Microsoft SQL Server DB Instance from the Amazon RDS console. In fact, it is a best practice to delete instances you are no longer using so you don’t keep getting charged for them. You have created, connected to, and deleted a Microsoft SQL Server Database Instance with Amazon RDS. 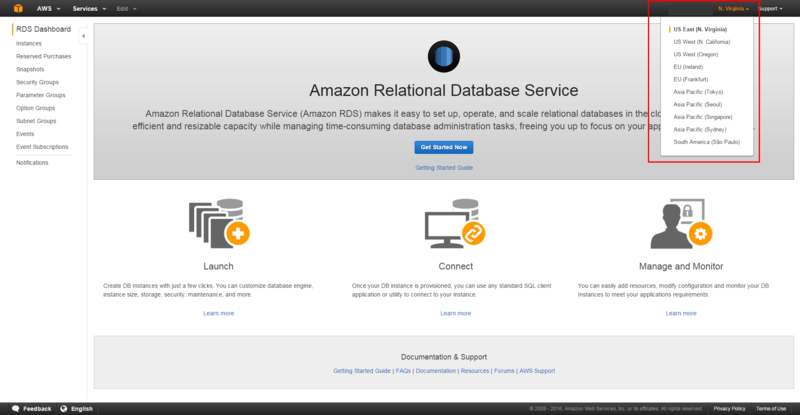 Amazon RDS makes it easy to set up, operate, and scale a relational database in the cloud. It provides cost-efficient and resizable capacity while managing time-consuming database administration tasks, freeing you up to focus on your applications and business. 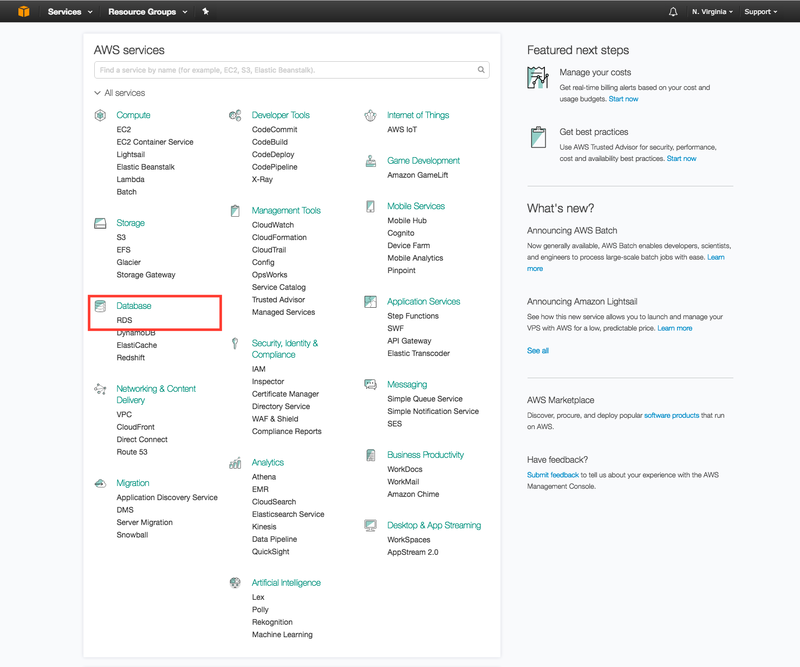 Now that you have learned to create and connect to a Microsoft SQL Server Database through Amazon RDS, you can progress to the next tutorial where you will learn to restore a DB Instance from a DB Snapshot.